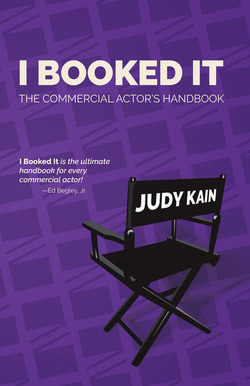 I Booked it - The Commercial Actor's Handbook! Judy Kain has been a professional actress now for 37 years, showcasing her skills and talents in over 350 commercials and in over 80 roles for film and television. Some of her more well-known credits include a Television Series Regular on The Jackie Thomas Show and a Recurring role on the Emmy-winning show Mad Men, a role which won her a SAG Award. Her other favorite recurring credits include Married with Children, For Your Love, Grosse Pointe, and Manhattan, AZ with Chad Everett. She has done numerous guest appearances on the hit shows Modern Family, The Middle, Bones, Castle, Scrubs, Desperate Housewives, ER, Seinfeld, The District, The West Wing, NYPD Blue, Friends, and The Drew Carey Show just to name a few. Her teaching career has also lead to immense success, being voted BACKSTAGE WEST'S FAVORITE ON-CAMERA COMMERCIAL TEACHER IN LA in 2010 and 2011. Her other acting classes have won BACKSTAGE WEST'S FAVORITE IN LA as well, and continue to produce amazing results for her students. She teaches Advanced Callback, Commercial A to Z and Commercial Wednesday Workouts. “Well, how long did it take you before you began practicing surgery?” I asked with a smile. Just like my acting student/surgeon, most people wouldn’t dream of trying to start a new career in any field other than acting without getting the proper training, doing whatever it takes to make themselves competitive. Honestly, the best teacher of commercial acting is the commercial itself. Watch commercials, study them, and find yourself in them. Put the remote down and watch the stories being told in the amazing 30-second short films called commercials. There is much to be learned via this exercise, from tone and style, to how to dress for commercials, to how to wear your hair, to the nuances of an understated performance. Find a class that can give you solid, specific, on-camera training for the art form of auditioning for commercials. For a small investment, you can find out in six to eight weeks if this is something for which you have a passion and ability. You will be able to get some insights as to what will be in store for you. Your best choice is a class taught by someone who is currently doing what they are teaching. You get firsthand experience from a professional who is active and successful in the subject being taught. A long as they still love what they do, you will be in good hands. Check out the instructor on the IMDb (Internet Movie Database), and run their name by several different sources, ideally working commercial casting directors or agents who are active in commercials. You must be able to see what you and others are doing through the eye of the camera. Since auditions for commercials are always done on camera, it is crazy to take classes without actually working in front of one. You’ll learn what works and doesn’t simply by watching the other students. Most classes should offer a recording for you to review and see your growth. Commercial trends change quickly, and current copy is critical for you to practice for the auditions you will have. These days, most commercials don’t even mention the product in the spot. Only the voiced-over tag tells us what the product is. You cannot learn everything you need to build a sustained career in a one-day seminar. You may become inspired or motivated in a day, but you won’t be trained. There are at least five different types of commercial auditions, and different techniques specifically apply to each of the five types. Building skill upon skill is critical for a confident commercial actor. These new skills take time to develop and they are critical to know. Some techniques you will only do in an audition and nowhere else. For example, in an audition you have to motivate out towards the camera. You would never do it on the actual set, or even during a theatrical interview, but at a commercial interview, it’s vital that you motivate towards the camera so you can be seen. An industry person should be scheduled to come in at the end of class so you can make connections. You have heard the adage, It is who you know in this town. Unfortunately, it’s true! You want to build relationships based on your talent. So take a class, hone your skills, and then meet those who have the power to bring you in. Don’t meet them before you study—you want your first impression to be a good as well as a lasting one. This is just the beginning of your commercial training. Start with the basics to get you going, then you will find that you need to take some improvisation to loosen you up. Improv training will add a layer of spontaneity and quick subtle responses to your acting when you do auditions. You may find that you are not getting enough bookings and may need to take an advanced class to help you turn callbacks into bookings. Or perhaps you’ll need to spend a year or two in a theatrical technique class to learn how to access your emotions. At some point, we actors often feel we no longer need to continue training. Always remember that is not the case. Classes refresh a tired performance, classes give us new perspective, and most definitely, classes rid of us of our bad habits. Equate acting classes to gym workouts—you know what happens when we stop going there! Our muscles get weak, flab starts to appear and we lose our momentum. The same thing happens when we take a break from class. Our acting techniques become soft and out of shape. You never know when you’ll have a chance at an audition. You want to be on the top of your game at that moment—you don’t want to be in a slump! Do your research. Find a class that suits your needs. A professional actress for 38 years, Judy has show- cased her skills and talents in hundreds of commercials and film and television roles as well as transformed count- less actors’ careers with her two schools. Judy co-founded Talent To Go, a training company that won The Best Casting Director Workshop in LA award in 2009 and 2010. She continued her teaching legacy and success when she opened Keep It Real Acting in 2012, an award-winning full-service acting studio that offers commercial and theatrical classes for all levels of students. She was voted Backstage West’s Favorite On-Camera Commercial Teacher in LA in 2010, 2011, and 2012 and again in 2015. Several of her classes have also won Backstage West’s Favorite in LA awards, and the school continues to produce amazing results for her students. Judy’s hundreds of well-known credits include a SAG- award-winning recurring role on the Emmy-winning show Mad Men as Olive Healey (Peggy’s secretary). Other favorite recurring credits include Odd Couple with Matthew Perry, Hand of God with Ron Pearlman, Married with Children, For Your Love, Grosse Pointe, and Manhattan, AZ with Chad Everett. Judy has done numerous guest appearances on the hit shows Modern Family, The Middle, Bones, Castle, Rizzoli & Isles, Scrubs, Desperate Housewives, ER, Seinfeld, The District, The West Wing, NYPD Blue, Friends, and The Drew Carey Show among others. Her more than 375 commercial credits include several career highlights. Her role as judge in the famous Clairol Herbal Essence ad with Dr. Ruth was famously (and hilariously) spoofed on Saturday Night Live. She appeared in two acclaimed Super Bowl ads in 2013, Oreo’s Whisper Fight ad and Deon Sanders’ NFL promo. The proud mother of one son, Frankie Manes, Judy resides in Los Angeles. One of my favorite things about teaching the Advanced Callback Commercial Class is learning from all of the amazing industry guests that visit class each week to provide feedback and insight. We have a playlist on youtube where snippets from our guests are continually added, but its best to perform for and learn from our guests firsthand in class. We hope to see you there! Some of her more well-known credits include a Television Series Regular on The Jackie Thomas Show and a Recurring role on the Emmy-winning show Mad Men, a role which won her a SAG Award. Her other favorite recurring credits include Married with Children, For Your Love, Grosse Pointe, and Manhattan, AZ with Chad Everett. She has done numerous guest appearances on the hit shows Modern Family,The Middle, Bones, Castle, Scrubs, Desperate Housewives, ER, Seinfeld, The District, The West Wing, NYPD Blue, Friends,and The Drew Carey Show just to name a few. Her teaching career has also lead to immense success, being voted BACKSTAGE WEST'S FAVORITE ON-CAMERA COMMERCIAL TEACHER IN LA in 2010 and 2011. Her other acting classes have won BACKSTAGE WEST'S FAVORITE IN LA as well, and continue to produce amazing results for her students. She teaches Advanced Callback, Commercial A to Z and Commercial Wednesday Workouts. Often, we as actors feel very alone in the entertainment industry. You didn't get the part, forgot your lines or you feel duped because the wrong people scammed you for money. These things and more weigh on our artistic minds more often than not. How do I make sure I am slating properly, or making the right decisions for a cold read? Are my head shots working for me? How do I find the right instructors, agents, managers, etc? Help is right under your nose. There are so many assets out there, utilize them! The entertainment business works when you surround yourself with a “team” you can trust, that will help make your career flourish. Coaching and practice. A good actor can make incredible moments created by the tiniest emotional nuances look easy. But these moments are executed by actors who have honed their craft. They utilize the tools they have studied for years to give the “performance of a lifetime.” And, although an actor might be by themselves in a scene, it’s important to ask: how did they get there? Reading your lines in front of a mirror does not make you a great actor. You must learn from a mentor or coach. Throughout the history of acting, instructors like Stella Adler or Lee Strasburg crafted the art by the actors workinh in front of an audience. Whether it is a peer, friend or mentor it is important that we speak our lines out loud. So many actors in class or, God forbid at an audition, do the silent read. If it is a cold read and you don’t have someone to read lines with, don’t stay silent. Find a space in the hallway or outside and talk your lines in the voice you plan to use. You will be surprised how different your choices and decisions for the part will come to fruition when reading in front of someone. This is the beginning of your team creation. Research. Putting the proper team together can be as simple as starting with your instructor, and as hard as picking the right accountant. In the beginning, you should be focused on the right teacher or mentor. Research is the key. As an actor, researching a role is part of the job. You don't buy a car without a test drive, or learn to ride a bike without Dad holding the handle bars while you gain your balance. So, why would you create your team without proper knowledge of the people who can help make or break your career? Rules to live by. It is important to have a good rapport with your instructor, manager, agent and even your photographer. If your instructor is demeaning or makes you uncomfortable, get away from them! Most acting teachers offer an audit of their class. This lets you see for yourself how the class is taught and if it is a proper fit. Agents and managers work much the same way; you are interviewing them for the best representation. Remember, it is a business and your success is their success. As your career begins to blossom, the team becomes bigger and the stakes get higher. You will need a lawyer, an accountant and probably a personal assistant because the business moves fast and you must be prepared. Are all these people necessary? Can't I take care of things on my own? Not likely, as you grow and opportunities continue to rise, going it alone is not advised. Talk to your peers, be inquisitive about how others have built their teams. At whatever level you find yourself now, it is important to start practicing good team building. These essential skills will follow you throughout your career as you find your puzzle pieces starting to fall into place. Wayne Frazier (“Transparent,” “Kroll Show”) is an actor, writer,producer and host. Wayne currently hosts Hollywood Close-Up with Natalie Lipka (“Criminal Minds,” “Kroll Show”), an audio podcast that focuses on creating your own career in the entertainment industry. On the show, we discuss the latest in the entertainment world and trending topics in social media, and provide insight to those pursuing a career in “the biz.” Each episode includes a close-up interview with one of Hollywood’s finest working actors, directors, producers, writers and other industry professionals. As a Children’s Acting Instructor and Coach, I often work with kids who don’t have any “credits” yet in the business. For this reason, parents have not put anything but their child’s name, age and contact information on the back of their child’s headshot or picture. This doesn’t give a potential Agent, Manager or Casting Director much to go on when considering whether to see your child. With all of the competition out there, there are things you can put on your child’s resume to give them every advantage. First, if your child does not have traditional credits, that’s ok. Everyone begins somewhere. You want the person looking at your child’s resume to learn something about your child. What does your child like to do outside of acting? For very young children, this can be simple things such as loves to swing, rides a tricycle, scooter, swims with floaties (or without), loves to sing children’s songs, likes to do somersaults. Don’t forget unique characteristics such as has a cute belly laugh, dances in a funny way to music, or has a cute lisp that’s still understandable. For school aged children, it can be any school performances in which they’ve performed, music lessons, karate, gymnastics, sports teams, skateboarding, choir, expert at video games, competes in Science Fairs, loves to run, Scouting, dirt biking, water skis, snorkels, etc… And for all ages, list ANY acting classes they have taken, including the instructor’s name and the studio’s name if applicable. The more a person can get to know your child, the better your chances are that they may get called in for an audition or Agent meeting. The most important thing is to make sure your kids are having fun at whatever they do. 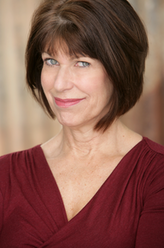 Donna has more than 20 years experience as a professional actress and broadcaster. She is a former TV News Anchor and Television Show Host and has been seen in more than 100 commercials and Industrial films, most recently for clients such as Sara Lee, Suave, Curves, Farmers and Merchants Bank of California and Reliant Energy. Donna can be seen in the Ben Affleck thriller “Gone Girl” and has a lead role in “The Periphery” now winning awards at film festivals. Recent television credits include Criminal Minds, Revenge and the new ABC series “How to Get Away With Murder”.